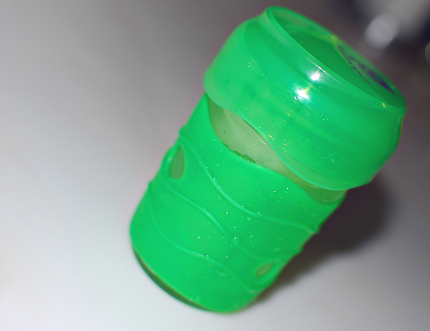 A couple years ago I compiled big lists of BPA free kids cups. Most of us were used to giving our kids plastic sippy cups to avoid spills but when we found that BPA or Bishpenol A had the potential to harm our children we sought better options. Our demand for better products was so loud that MANY companies reformulated their products to offer safer cups and many new companies popped up to fill this need as well. Still for many moms, myself included, there was still something missing. Yes we had safer cups but they were made of plastic.. which frankly can have other issue besides BPA. While I gave moms who wanted plastic options they needed I scoured the net for stainless steel cups and I bought up small mason jars at thrift stores for my own kids. With out mix of stainless steel tumblers and little glass jars we made do, but I DID miss the sippy cup option! Now a company has stepped to the plate to provide an answer for us picky moms… a glass cup with plastic sippy attachment, and a sleeve to prevent breakage. It is quite simply the most awesome safe sippy cup I have yet seen. 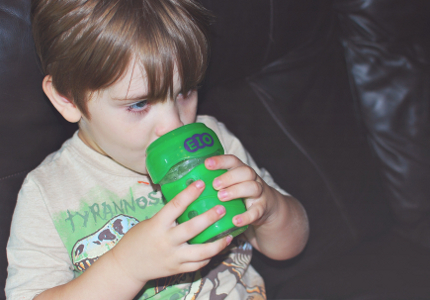 I am really loving it… the EIO Glass Cup for Kids. The design is similar to what we now see in glass baby bottles. It has a silicone sleeve that prevents breakage of the body.. which is glass. The top portion is BPA, Phthalates and PVC free plastic with a small hole in the inclined area. There is no spout or valve that is impossible to clean or that allows for mold growth. It is dishwasher safe. The BEST part though is that the lid fits on to virtually any 8 ounce canning jar!!! Yes… if your cup breaks (which is unlikely IMO) you can replace with a canning jar, easy peasy! I just love the whole concept, especially the part where I do not have to buy another cup if the part most likely to break, does in fact break.. I can just use a caning jar I already have. The top plastic part is very sturdy and unlikely to break IMO. The sleeve is nice but not really a necessity.. if it were to rip somehow, the cup would function just fine without it. Up until we got the EIO cup we were just using open cups (both metal and glass). We had lots of breakage, which was no biggie really but the spills were getting out of hand. Since we have started using the EIO that issue is gone, thank goodness. We have the green cup but there is also purple and orange and I am considering getting one for my 6 year old too because the cup does not have a babyish appearance and it would help with dinner time spills. This cup is great for older kids too. I don’t like using plastic or buying new plastic but I will buy “smart” plastic. Something that will be reused over and over again, that will last, and that makes it easier to use less plastic overall. This cup definitely qualifies. All in all, I am pretty excited about his new innovation. Some companies see a need and they do the bare minimum… like take the BPA out of their existing cups. Other companies see moms who are concerned with not only the chemicals but also the reliance on plastic and the move towards other materials and they come up with a solution. 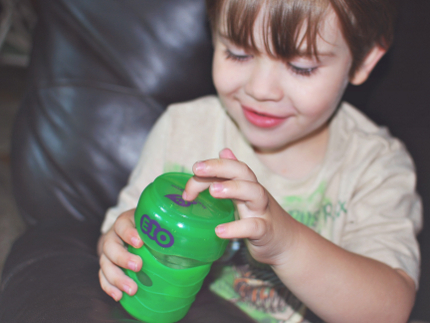 I love the EIO cup but I also love the fact that one company stood up and took notice of what I (and other moms like me) wanted in a kids cup and they delivered. It should be no surprise to anyone that is was in fact a mom who invented this cup… a mom that wanted to empower her kids to use REAL, earth friendly dinnerware at the table. Much thanks to Kathy Haskell of EIO for the awesome product and for sending me a sample cup to review at my request.